Parasite control for livestock can take several forms: chemicals sprayed or wiped topically, ear tags, and even pressed blocks that deliver insect growth regulator along with vitamins and minerals. We have had quite good success for the past 14 years spraying our yaks a couple of time per week with Permethrin 10% insecticide spray. We buy it in concentrate form and mix it up in 1⁄2 gallon pump sprayers. When the yaks come up for breakfast, we lock our ten animals in the corral and spray both sides as they move around. Yes, they get in- stant relief from the biting insects, but this is not a fun job--and heavy rain will wash it all off. For added control especially for horn flies, we also put insecticide ear tags (Y-Tex Python Magnum - pictured left) in one ear each May and remove them each October. I found this form of garlic to be very inexpensive. We fed it only May through October and for $165 per 40# bag we supplied 10 yaks, 2 horses and 5 Golden Retrievers with the minimal “Good” dosage for the season. We started our yaks on the garlic May 17th, 2014. I estimated the total weight of the herd and figured for the “Good” dosage they would need 5 scoops per day. We decided to start them at 50% (2.5 scoops) to see how they liked it. Garlic needs to be eaten daily for a couple of weeks before the full repellent action can be observed. To our surprise they liked the garlic right away. We mixed it with their breakfast: a tiny bit of 3-way grain w/molasses and their 12/12 Vitamin Mineral Plus Cop- per. The yaks even came up later in the day to lick out all the feeders again. There was no way to control how much each yak ate, but we did see all the yaks, even the calves, ingesting it. This photo from the University of Wyoming shows hundreds of horn flies on an animal each after a bite of blood. At 50% of the ‘Good’ dosage we only saw horse flies that continued to bother the yaks...no other flies. I decid- ed to raise the dosage to see if we could get rid of the horse flies, and we also sprayed the yaks with Perme- thrin after heavy rains for additional control. We ended up giving the herd 3 scoops of the garlic daily--still less than the “Good” dosage. They did marvelous all summer. Yaks seem to need less of the garlic than horses do for the same effect. It was amazing to see our yaks stand around all day unbothered by flies. They were con- tent even in the hot weather. For proof that is was working, all I had to do was drive a few miles from home to observe a herd of Angus cattle out on pasture. What a difference....those poor cattle were huddled under shade trees swatting at flies and stomping their feet...they were miserable!!! It is now May of 2015 and we started the yaks on the garlic May 1st with plans to work up to their full dose of 3 scoops daily in a month. This is when the flies ar- rive in our area. Please note, every area is different - our part of Colorado is nor- mally pretty dry, and at 6700 feet in elevation we don’t have a huge insect prob- lem. Your results may vary depending on your geographic region, the weather, and the type of flies native to your area. Lynda Gehring and her husband Mike have lived in Colorado Springs, Colorado for 26 years. They both grew up with dairy or beef cattle, horses and dogs and have a major love for animals. In addi- tion to their on-site dog boarding facility, they have raised Golden Retrievers for 26 years and cur- rently have six...five of which are champions. In 1999 High Country Critters was established when they bought 35 acres, built their own home and by 2001 had purchased their first four yaks. They are a small yak breeding operation with just 10 yaks - some have been with them for 14 years and all are registered with IYAK. Lynda has served on the Board of IYAK and has done extensive research on Yak nutrition. Lynda & Mike’s goal is to combine the very old bloodlines with the new...creating large yaks that carry more coat, but not excessive. 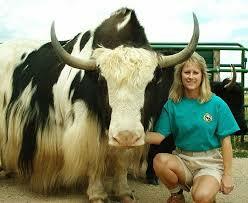 Their love for yaks is apparent as they have devoted over two decades to raising these amazing animals.